StrucSure Home Warranty is proud to announce it has presented Dan O’Dwyer, President of O’Dwyer Homes, with its Platinum Builder Award. This award represents a mark of excellence and designates O’Dwyer Homes among the top builder members in the country. Obtaining a Platinum Builder designation with StrucSure Home Warranty is an accolade that is presented to builders who have maintained a high level of customer satisfaction and have shown exemplary building practices and strong industry involvement. Dan O’Dwyer is a licensed home builder in the state of Georgia, is a member of the Board of Directors of the Greater Atlanta Home Builders Association (GAHBA) and is a member of the prestigious Certified Professional Home Builders Program (CPHB). 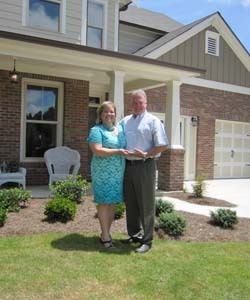 In 2006, O’Dwyer Homes was recognized by its peers with a Builder of the Year award from the GAHBA at the annual OBIE Awards. Dan O’Dwyer gives back to his community by maintaining an active roll with HomeAid Atlanta, a non-profit organization that provides shelter to homeless women and their children. Over the past 20-plus years, O’Dwyer Homes has built more than 1,000 homes in the Atlanta metro area. Each home has been constructed with careful attention to detail, quality construction and the latest trends in building practices. As a builder who is focused on energy efficiency, every home built by O’Dwyer Homes is Energy Star certified by a third-party. O’Dwyer Homes’ customer satisfaction program represents the epitome of excellence recognized by the StrucSure Home Warranty Platinum Builder program. O’Dwyer Homes goes above and beyond in ensuring their customers are satisfied and protected with third-party, insurance-backed structural warranty coverage from StrucSure Home Warranty. “In a competitive housing market, this is a must have to attract buyers and close the sale,” said Donna Steakley, Director of Marketing for O’Dwyer Homes. “The entire O’Dwyer Homes team always focuses on putting the customer first while demonstrating the highest level of integrity and providing exceptional customer service from the beginning to end of the buying process,” commented Steakley. For more than 16 years, StrucSure Home Warranty has been providing builders, remodelers and contractors with warranty products that deliver peace of mind. Our warranties protect our clients from expensive claims, liabilities and legal fees, and offers their clients peace of mind through third-party, insurance- backed warranty protection. Just like any risk management product, the hope is that you’ll never need it, but when a problem emerges, you’ll be glad you’re covered! For more information, call Cindy Huber, Vice President of Sales, Eastern Division, at 770-363-7823, email chuber@strucsure.com or visit www.strucsure.com. This entry was posted in People and tagged home warranties, StrucSure Home Warranty on August 29, 2013 by admin.